I have participated in sports since I was 11 years old, especially in Olympic wrestling at a university level, competing in the LAI (Liga Atletica Interuniversitaria). For the past four years I have been working as a personal trainer and I am completing my BA in Science of Physical Education. 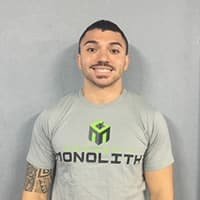 When Crossfit Monolith opened I developed an interest in Crossfit, I started practicing it and eventually took the Level 1. I started working as the On Ramp coach, and continue practicing it to maintain excellent balance in my health. I have played baseball since I was 4 years old, I had the opportunity to play baseball in the Dominican Republic and in the varsity team of the UPRM. In 2014 I graduated UPRM and became a physical Education teacher. After that I started working on a Gym as a trainer and coworker showed me some Jason Kahlipa Crossfit videos and I became obsessed with the sport. In 2015 I started working On HCOA fitness in Carolina as a trainer and immediately noticed the Box I started working out every day and in 2016 became the Crossfit Monolith ON-ramp coach. Since I was 10 years old I practiced volleyball and a bit of basketball. When I got to college in one of my tournaments I tore my right knee ACL and because of this I had to stop playing and training for a whole year. When I graduated college I subscribed to a gym and started doing basic exercises until my knee got strong again. After 2 years in this gym they started offering CrossFit and I decided to give it a try and was there for 3 months. Then I enrolled in HCOA Fitness Plaza Carolina and noticed that CrossFit Monolith was looking for an employee and went to apply for it, and now I’m working and training here. Love the training that I do here and love this job. Certs (not just CF, PT, anything): ICG (indoor cycling group instructor). I’ve been working out since I was 13 years old, but ever since I can think of, I’ve felt passionate about fitness. 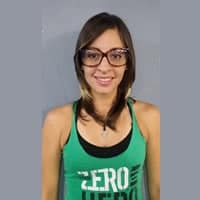 I started working in the fitness industry when I was 20, and throughout my journey I have been able to work in both, unisex gyms and ladies gyms. 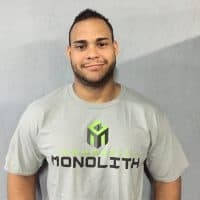 Today, I am proud to be the District Manager of 5 HCOA gyms (Carolina, Ponce, Paseos, Bayamón and Fajardo) in addition to being the Supervisor of Crossfit Monolith Carolina. In order to keep up with a healthy lifestyle and a demanding job, I started doing crossfit and I’ve fallen in love with it! The overall improvement I have experienced in my performance, not only personally but at the box, is amazing!